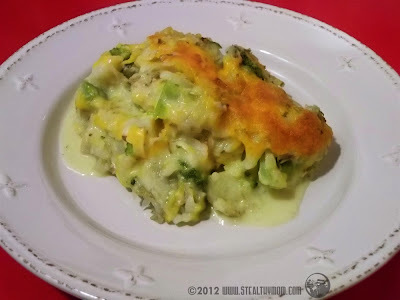 This is a one-dish wonder: broccoli, cauliflower, grated potatoes, milk and cheese are layered into a casserole dish. After baking, you get a baked broccoli with a rich cheese sauce. The flavours of the potatoes and cauliflower blend in. The cover of the January/February 2012 issue of Vegetarian Times features a Mac-n-Cheese Style Cauliflower dish. I was about to make it, when I thought about all of the potatoes we have... Instead of a roux, could we bake potatoes, milk and cheese with the cauliflower to make a sauce in the casserole dish? And why not sub half of the cauliflower for broccoli, since our kids like broccoli better? My first attempt tasted okay, but the texture was more like scalloped potatoes. The second time worked out much better after some minor adjustments. Preheat the oven to 375F. Butter the inside of a deep, lidded casserole dish. Grate the potatoes and cheese. (I cheat and buy grated cheese when it is on sale and keep it in the freezer.) Set aside a quarter cup of the cheese. Assemble the casserole: Layer potatoes about an inch deep at the bottom. Sprinkle cheese over top. Put half of the vegetables over that layer, topped by more cheese. If you are using parmesan, sprinkle two tablespoons over at this point. Follow with another layer of potatoes, cheese, vegetables, and cheese again. Put the rest of the potatoes on top. Firmly press the contents of the casserole dish down with your hands. Pour the milk over and put the lid on. Bake for about 45 minutes to an hour, until the surface bubbles. Take the lid off the dish, sprinkle the remaining cheese over the top and put the casserole back in the oven. In about 15 more minutes, the cheese will be melted and start to brown on top. Take the casserole out of the oven and let it rest for at least 10 minutes before you serve it up. Check out other healthy recipes at Meatless Mondays, Healthy 2Day, Gluten Free Wednesdays, Real Food Wednesdays and Fight Back Fridays. We're having this tonight! It sounds really good. I'm using fresh broccoli & cauliflower though. Any thoughts on that? Increase cooking time a bit maybe? Blanch ahead of time? Hmmm... I'd say to to keep it the same and to check on it a few minutes earlier. I chucked mine in frozen, so part of the cooking time was the veggies thawing. (It's cheaper to buy frozen than fresh around here so I welcome the convenience as cheapness.) Tell me how it goes! Well...just now getting back over here to report! We did eat this - I liked it a lot and so did 2 of my kids and my hubs. I cooked it for the length you specified and did not first blanch my veggies. We had it has a main dish on Monday and then as a side dish with baked chicken on Tuesday. Pretty good! Thank you checking in! I often bite my nails about it, wondering if my directions are clear.